J/News Articles: Inaugural J/80 Asian Championship Announcement! (Xiamen, China)- J/80 production in China started in 2008. Since that time hundreds of J/80’s have been built in China and supplied around Asia and many into new Chinese fleets. This year production has been steady at 1 1/2 boats per week, non-stop. New fleets have developed in Qingdao, Sanya and Suzhou in 2018. The J/80 Chinese Class has been established and is now the only class in China that is working with a complete set of World Sailing class rules; including boat weight equalization, sail measurements, safety gear checks and crew weight limits being enforced. 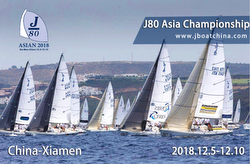 This year’s J/80 Asian Championship will be raced out of Wuan Bay in Xiamen, from December 4th to 10th, 2018. The class anticipates the fleet will be 40-65 boats with teams from around Asia. The first twenty new charter boats will be pre-checked on boat weight and safety gear. Sails and the safety gear list will be checked prior to registration. Three days planned for checking boats and practice. Priority will be given to international teams not based in China up until October 1st. The racing area is not far from the docking areas and the plan is for two to 4 races per day over four days of racing. This will be an open J/80 event, so no issues on professional sailors in the class rules. Each driver will need to be a member of either the international or national class association. This can be done at registration. If you or your team are interested in participating this December please contact- Jim Johnstone at J/Boats China- email- jimjboats@icloud.com Add to Flipboard Magazine.